It seems like every week there's another new story or Facebook post about rattlesnakes terrorizing some unsuspecting Westerners. Whether they're crawling up through the toilet, battling it out in a backyard, cruising up the driveway, or crashing a wedding, these menacing reptiles seem hellbent on scaring the living daylights out of us. And you never know, there could be dozens of rattlesnakes living under Texas homes in your neighborhood. When you live in Texas and surrounding states, rattlesnakes are just a part of American life. They aren't going anywhere. After all, this is their home too. Sure they're scaly, slithery and downright scary, but you don't have to totally hate rattlesnakes. The more we learn about our reptilian neighbors, the better we can co-exist. Here's what every Texas homeowner should know about rattlesnakes. According to the South Texas Poison Center, Texas is home to eight different types of these snakes so reference our rattlesnake roundup below. The Western diamondback, identified by diamond markings along its back and black and white rings on its tail, resides everywhere but the easternmost section of the state. 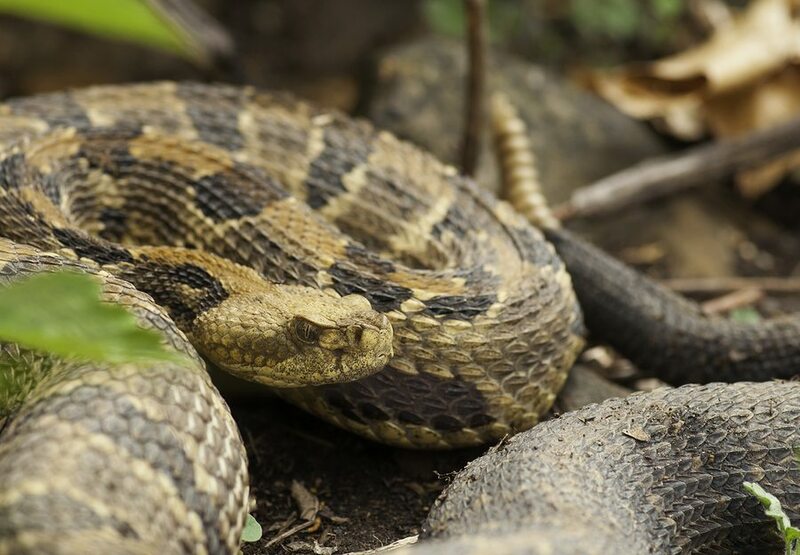 The Timber rattlesnake, a large brown or tan rattler that stretches up to four and a half feet, can be found in wooded areas and swamplands in East Texas. A mottled rock rattlesnake in the desert of west Texas. The Mottled rock rattlesnake can be found in the mountains of west Texas. These snakes are a very light pinkish color with dark crossbands. They're usually about two feet in length. A banded rock rattlesnake in the Penloncillo mountains on the Arizona and New Mexico border. Found only in the western tip of Texas, the Banded rock rattlesnake is a dark green or grey. Found throughout central Texas and much of west Texas, the Blacktail averages a length of three and a half feet. These snakes are either dark grey or olive green and have dark spots along their backs and tails. The Mojave Rattlesnake is considered by many to be the most deadly snake in the United States. The Mojave rattlesnake is only found in far west Texas. It looks similar to the Western Diamondback, only more slender. Prairie Rattlesnake (Crotalus viridis) in Badlands National Park of South Dakota. Found in the grassy western plains of Texas, the Prairie rattlesnake is a green or grey snake identified by rounded spots down the middle of its back. Now that you know what to look for, you can be better prepared to keep an eye out for rattlers all around Texas. But if you do have a reptile run-in, here's what to do if you're bitten. Snakes get a bad rap, but they're actually very beneficial to our ecosystem. In fact, the benefits of rattlesnakes far outweigh the threat they present to us. Rattlesnakes eat rodents, helping to eliminate rodent-borne diseases. They help moderate rodent populations, so critters don't run rampant and damage crops. Rattlesnakes are also necessary prey for owls, foxes, coyotes and even other snakes. The National Wildlife Federation reports that while most rattlesnake species are stable, certain species and subspecies are considered threatened because people see them as pests rather than an integral part of the ecosystem. They may look scary, but rattlesnakes do way more good than harm. The chances of actually dying from a rattlesnake's venomous snake bite are very slim. Texas Parks and Wildlife reports that about 7,000 people are bitten by venomous snakes (not just rattlesnakes) annually. Only .2 percent of these bites are fatal. On average 1-2 people in Texas die each year from snakebites. Rattlesnakes also have a fairly week venom compared to vipers and cobras. And about one-third of rattlesnake bites are actually "dry bites," where no venom has been injected. That said, rattlesnake bites are still a serious threat, and there are steps you can take to avoid them. First, be cautious when hiking. Be aware that when temperatures are high, rattlesnakes typically hide beneath rock or wood piles and in shady areas. You should carry a walking stick to check brush for snakes before walking through. In cooler weather, the snakes are more likely to be out and about, catching the sun in the middle of the road or on top of large rocks.